From the publisher that brought you Game of Thrones… Prince of Thorns is the first volume in a powerful epic fantasy trilogy, original, absorbing and challenging. Great read. Strong characters who break the mold of the traditional fantasy heroes. I loved the way that the story (and plot twists/reveals) unfold. Well paced and excellently written. About to get into book two. The main character is certainly very evil, but I was still drawn to him. (Only so many books you can read in a row where the hero is the knight in shining armor.) A captivating story that moves along at a brisk pace. It avoids length, boring descriptions and gives the story depth with flash backs to the past. This gives the story context in an interesting manner. I'd recommend this book for 16+ yo readers because it is very gory. I particularly liked the writer's style and quality of writing - he reads as someone who has actually worked to hone his craft. The author uses his skills to make his story a captivating and engaging experience. There are too many books these days with incorrect grammar and poor sentence construction - this author is not one of them. 4.0 out of 5 starsGets better the more you read. 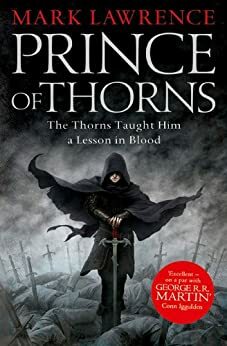 I wasn't sure that I liked this book when I first started reading it but it certainly does grow on you, much in the same way that the main character Jorg does. In this novel in particular Jorg is basically an anti-hero but I found myself liking him more for it. This phenomenon continues as the book goes on and really takes root when you start to read the next 2 books in the series. There are hints of secrets and idea that aren't fully explored unless you keep reading and continue into the next 2 books so don't expect to have all the answers at the end of this book. I will admit that it was difficult to remember all of the characters. It seemed to me that a lot of minor characters were introduced very quickly and seeing as they are all cut from a similar cloth it made it that bit more difficult to remember although I found that it did not detract from the experience much at all. The character development in this book is quite good and the author manages to make the characters, Jorg in particular, grow in such a way that you may not notice it at first which I found to be quite interesting. Overall this was a very good read and well worth the price. I really enjoyed this book. Throughout the whole book i found parts that made me cringe but then I began to appreciate the fact that the author managed to bring new emotions out in me. The twists and cleverness of the anti hero were really just awesome and there has never been an anti hero that better defined the label. A raw and bloody world, an anti hero fuelled by revenge ... I was transported straight to the Dark Ages.